A day before sending out program favorite Hidden Scroll for his stakes debut in the $400,000 Xpressbet.com Fountain of Youth (G2), Hall of Fame trainer Bill Mott watched as Claiborne Farm and Adele Dilschneider's Grade 1-placed homebred Mucho made a triumphant return to action with a 1 ¼-length victory Friday at Gulfstream Park. Ridden by Jose Ortiz and favored at 1-2 in a field of five 3-year-olds, Mucho ($3) ran six furlongs in 1:10.35 over a fast main track in the $51,000 optional claiming allowance for sophomores. It was his first race since finishing second in the Hopeful (G1) last summer at Saratoga. Ortiz allowed Mucho to settle in third after breaking from the rail as Lutsky and Releasethethunder went the opening quarter-mile together in 22.53 seconds. Ortiz tipped Mucho in the clear three wide leaving the backstretch and ranged up on the leaders around the turn after a half in 45.27, straightening for home with the lead and maintaining to the wire. Releasethethunder was second, a neck ahead of Lutsky. A bay son of Breeders' Cup Classic (G1) winner Blame out of the Pulpit mare Extent, Mucho was racing for the first time on Lasix in his 3-year-old debut. He was second in his unveiling last June at Belmont Park, then romped by 9 ¾ in a maiden special weight at Saratoga Aug. 4. He finished second as the favorite, beaten three-quarters of a length, in the seven-furlong Hopeful Sept. 3, his longest race to date. 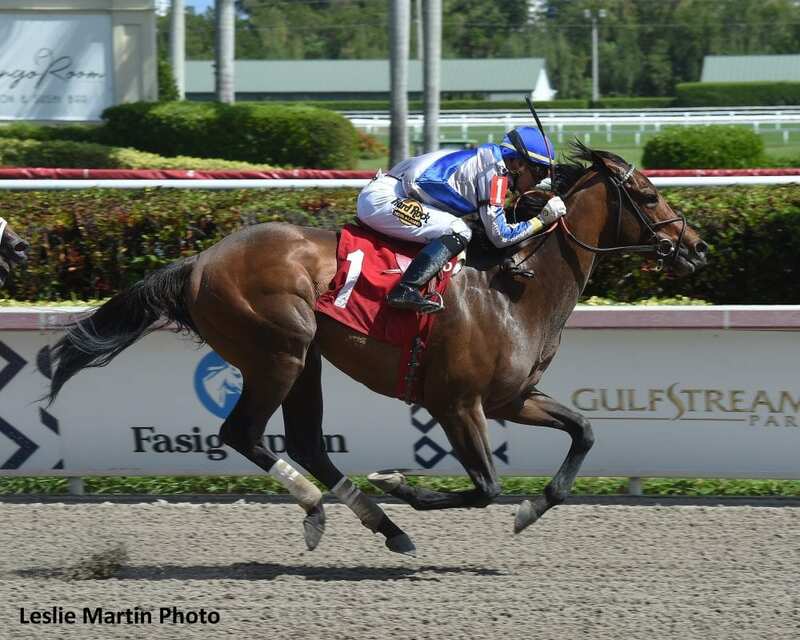 Mott said Mucho was turned out after developing some stiffness in behind after the Hopeful and showed seven works at Payson Park for his return, missing one breeze with a foot bruise. He said he will talk with the connections before looking for another spot. This entry was posted in Triple Crown and tagged Adele Dilschneider, bill mott, Blame, Claiborne Farm, Gulfstream, gulfstream park, Hopeful Stakes, jose ortiz, mucho, payson park, pulpit by Press Release. Bookmark the permalink.